The street sweepers have been around to remove some of the beach-worth of sand left after a season’s worth of snow. We’ve had a few 90°+ days. 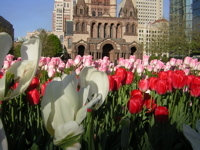 There are flowers in Copley Square. I had a few minutes last night to walk around before practice, before the light failed, and got a few good pictures, including the rooftop shot which was taken from the fourth floor of Old South’s bell tower. According to the Associated Press (via the Washington Post), the BRAC axe is finally falling on Fort Monroe, one of the country’s oldest military installations and the coolest one near my childhood home. Here’s my hometown paper’s take, together with some good photos of the fort, its moat, and a reminder of its Civil War past. Construction on the fort started in 1819, the same year that the ground was broken in Albemarle County for the University of Virginia. According to the official history of the fort, the current fortifications succeeded a series of colonial era defenses on the site, called Point Comfort, including Fort Algernourne, which was built in 1609 by the original Jamestown settlers. The fort was made obsolete by the introduction of long range bombers and aircraft carriers, but survived until this last round of base closings as a training command. I will always remember Fort Monroe for the community Fourth of July shows, which generally featured live musical entertainment (both jazz bands and military brass), culminating with a brass band performance of the 1812 Overture complete with field artillery and followed by fireworks. The Unofficial Homepage has some good information about the base (and a lot of broken links). 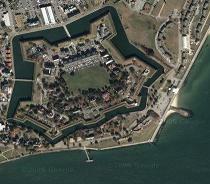 Map of Fort Monroe; satellite image from Google Maps; satellite image from TerraServer. Scoble: No RSS Feed? It’s a genetic marker for “lame site.” Good description of something I talked about here a while ago: offering RSS is part of entering a social contract with a potential reader that says I plan to update this content, and I care about influential readers and respect their time. …The documentary we are filming requires battle scene re-enactments. There will be yelling, campfires, and sword fighting. Ah yes, the great Broadsword Battle of Menotomy! Good to know that the History Channel guys are plumping for authentic locations.&lt;/sarcasm> Anyway, I’ll see if I can get photos tonight or tomorrow.